LECO C-200 CARBON ANALYZER MODEL# 605-700 SERIAL# 3162 230V 14A PHASE: 1 50/60HZ WITH THE FOLLOWING: INSTRUMENTATION BOOK INSTALLATION, SETUP, OPERATION, ADJUSTMENTS, MAINTENANCE, ETC. ALSO INCLUDES THE FOLLOWING SPARE PARTS. HEATER COIL (PORT# 776-129) (1) RV PORT CAPACITOR (2) LANCE AND FILTER ASSEMBLY (1) AMPEREX ELECTRIC OSCILLATOR TUBE SERIAL# H250310 PART# 771-354 TUBING (PART #S 773-662, 573-103) O-RINGS (31) 765976, (21) 772-520, (6) 771-991 (10) 601-920, (6) 762-058, (14) 772-269, (13) 772-738, (2) 781-424, (5) PISTON RING 773-577, (2) COMBUSTION TUBE RING 772-906, (1) ADAPTER RING 781-401 (2) THUMB SCREW FOR REMOVING SCREEN FILTER (2) STATIONARY BLOCK FOR CATALYST 772-688 (1) MOVEABLE BLOCK HEATER TUBE PEEKING 772-690, (11) SCREEN FILTER 775-306, (1) CAPACITOR 764-640, LANCE FLOW CONNECTOR 775-787 AND 773-324, (5) LANCE TUBE ASSEMBLY, (2) MOVEABLE BLOCK SCREW 772-694 (1) RECTIFIER 776-175, MISC. COMPUTER COMPONENT, 802151, (7) REAGENT STOP 789095 (20) ADAPTER RING SCREW 190-258, (1) PEDESTAL ADAPTER 783-745, MEASURE FLOW CONNECTOR (773-136, 772-704) (2) CAPACITOR 776-008, PLATE CHOKE 776-128, FILTERED PLATE SCREW 190433, PEDESTAL 605-816, ADAPTER TUBE BUSHING 781-423, LANCE GUARD 781-663 (2) 776-118, (3) BOROSILICATE FURNACE FILTER TUBE 601-390, (2) CELLULOSE FILTER TUBE 771-030 (4) INCOMING REAGENT TUBE 771-373, (2) ORE TAILINGS CALIBRATION SAMPLE #502-318, (4) IRON CHIP ACCELERATOR 501-077, (2) SODIUM HYDROXIDE 502-174, (2) PLATINUM SILICA CATALYST 501-587, (3) COPPER METAL ACCELERATOR 501-264, JUMPER FOR VACUUM CAPACITOR, (2) 501-082 BRASS BRUSH, (7) 772-381 LANCE CLEANING ROD (4) SCREEN 773-311, CELLULOUS 764-098, (626) CERAMIC CRUCIBLE HOLDERS, (187) CERAMIC CUPS, (2) TONGS (2,187) CERAMIC CRUCIBLES (2) QUARTZ WOOL 50G 502-177. The item "LECO C-200 CARBON ANALYZER MODEL# 605-700 WITH MANUALS AND SPARE PARTS" is in sale since Wednesday, May 11, 2016. 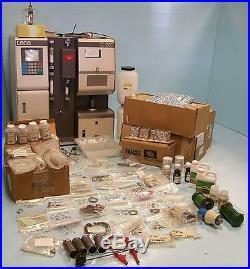 This item is in the category "Business & Industrial\Healthcare, Lab & Life Science\Lab Equipment\Analytical Instruments". The seller is "bamko1" and is located in Texas City, Texas. This item can be shipped to United States.